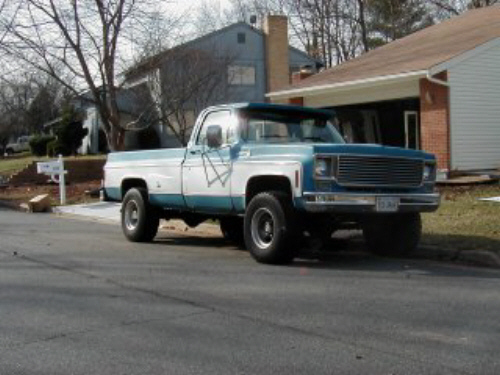 Dave Reidinger submitted this photo of his 1978 K20 Cheyenne. 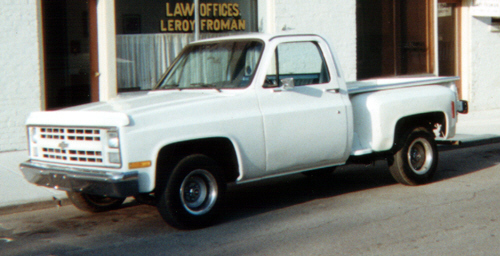 The truck is in original condition and is equipped with factory AC and dual tanks. The original dual exhausted 350 provides the motivation, and the 4 speed with a granny gear handle the shifting duties. The two-tone K20 rolls about town on 16.5x9.75 slotted aluminum rims. Dave future plans include a full restoration and possibly swapping a big block in place of the tiny mouse. Thanks for the picture Dave. 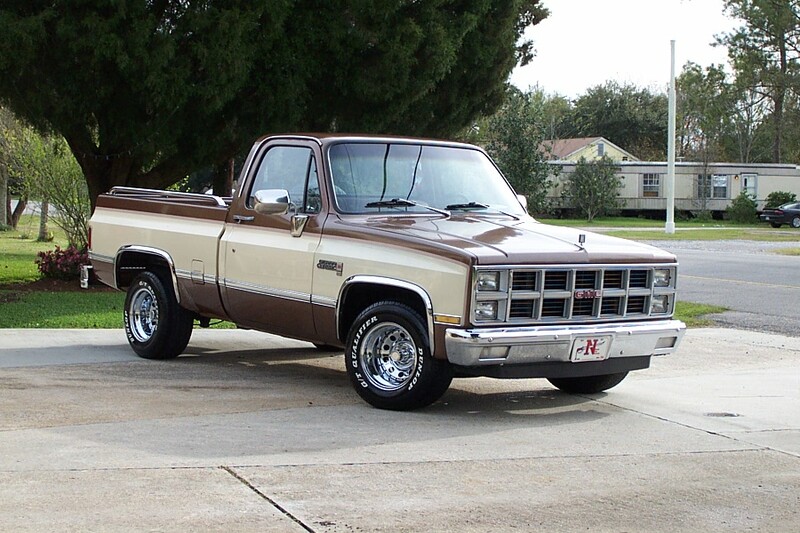 Eric Sonier sent in this shot of his 1981 GMC Sierra Classic. The truck's original paint is complimented by chrome bed rails, tailgate protector, fender trim, and chrome wheels wrapped in Dunlop GT Qualifiers. The original interior has been updated with a Grant steering wheel, Memphis 12" subwoofer and 6x9 speakers, Nakamichi amp, and Pioneer head unit. The original 305 is equipped with a 4 barrel carb, dual exhaust, and has over 100,000 miles. Thanks for the picture Eric. 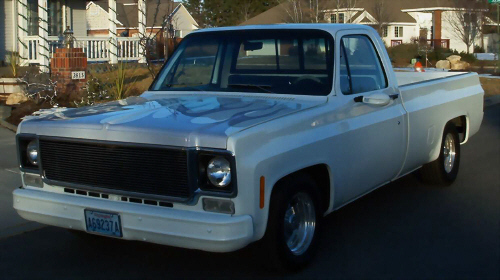 Ben Allen of Jacksonville, Arkansas saved this '87 R10 stepside from its previous work truck status. Ben replaced the lifeless 4.3 V6 with a 350 TBI equipped small block backed by a stock transmission. The body has been coated with pearl white and the bed floor has fresh wood. Thanks for the picture Ben. 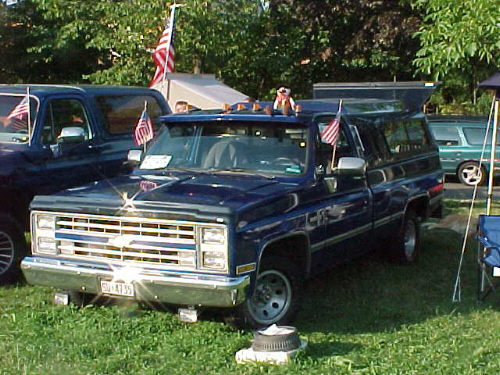 Robert Hohn sent us this picture of his '87 Silverado from overseas; Germany to be exact. The stock 305 has been mildly warmed over with a Crane cam, headers, Edelbrock intake, and Mallory ignition. Future plans include a roll pan, new blue paint, Cragar SS wheels, interior, and a possible lowering kit. Thanks for sending your picture stateside Bob! Matt Gingrich is the proud owner of this custom painted 1974 longbed. The obvious thing you'll notice is that it sports a lower stance courtesy of a 3/6 drop. The next attraction has got to be the custom pearl white paint, blue flames, and custom mirrors. The interior has been treated to a billet dash cluster and dash panel, new sun visors, door panels, carpet, and dash pad. Rounding out the interior is a custom stereo consisting of CD player, amp, and subs. Future plans include air bags, tonneau cover, steering wheel, fog lights, and shaved door handles. Thanks for the picture Matt.